1. Preheat oven to 350F. 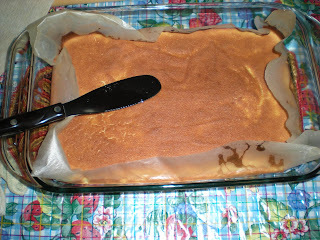 In a 9'' x 13'' baking pan, line with baking parchement. Oil the parchement. 2. In a large bowl, beat egg yolk with water and oil. 3. Place egg whites with cream of tartar in another large bowl until they form soft peaks. Gradually beat in the sugar. Transfer egg whites onto yolk mixture. 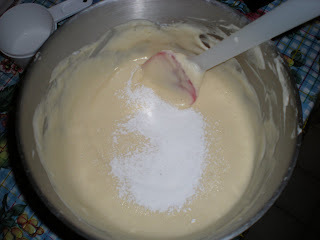 Fold gradually sifted flour with juice. 4. Transfer mixture into the prepared pan, spreading evenly. Bake for 15-18 mins, or until the cake springs back when pressed lightly. 5. Meanwhile, spread out a sheet of baking parchement. Turn out the cake onto this and remove lining paper. Neatly trim edges of the cake. 6. 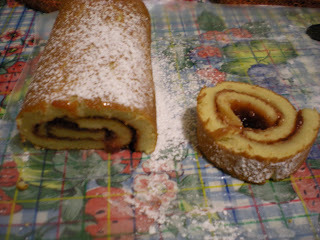 Spread your favorite filling and roll up the sponge quickly from one short side.